The silly, serious, brilliant play Apocalipsync: Humanity Is A Drag opened at the Montreal Fringe Festival. 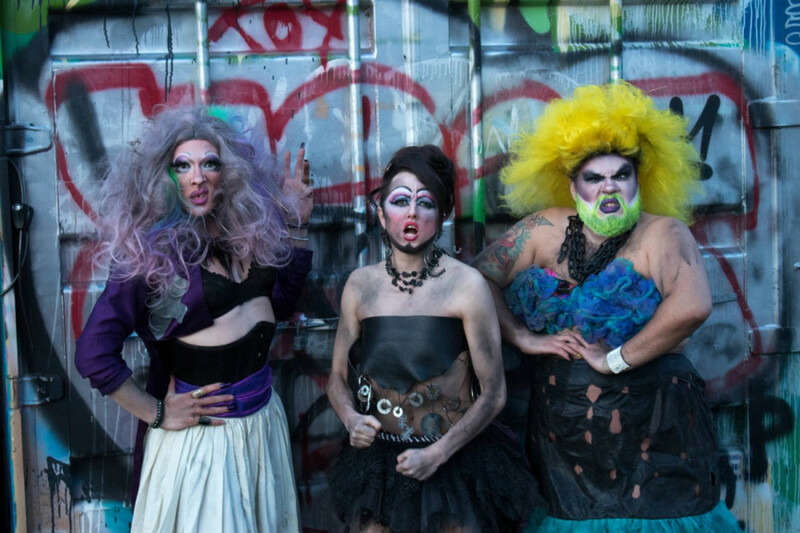 Drag queens Uma Gahd, Dot Dot Dot and Anaconda LaSabrosa from the House of Laureen, and guest star Peaches Lepage visited a post-apocalyptic future where the right has won over a collapsed left. In this world where there are no toilets, no indoors, and certainly no more makeup, they struggled, learned to cope and lip-synced their through misery. In Apocalipsync the queens found themselves in a dystopian world where society had imploded. With props of newspapers and worn-down cardboard boxes, a world devoid of modernity was created on stage. The queens responded and coped differently to the end of the world, all while exploring different types of leadership. The performers’ strong bond was evident, as they interacted with grace and ease around one another. The stage at the Théâtre Sainte-Catherine was quite small for their volume of hair, costumes and props, but the performers worked around and with each other seamlessly. I wish Apocalipsync would have included a few more powerful dance numbers, such as their performance to Destiny’s Child “Survivor” at the ““Fringe-for-all”, but I can always catch the House of Laureen at Café Cleopatra for their monthly events. It’s not the first time the House of Laureen performed at the Fringe Fest. In 2015, the group came together to create a show specifically for the festival. Laureen: Queen of the Tundra critiqued the Harper government and especially Laureen Harper for using her political platform to talk about her love of cats. Mixing drag and theatre, the House of Laureen offers a unique experience to their audience with their narrative format. The House has continued to write shows with a political edge since 2015, and is committed to building safer spaces. Apocalipsync is topical and addresses issues relevant to the current political and social context. As they are thrown into this new world, Dot Dot Dot thrives in nature and enjoys the new living situation, and Uma Gahd deplores the lack of everything she’s ever known, such as comfort, cell phones and toilets. Yet, both of them try to hold on to the world as it once was, struggling for power. To Miley Cyrus’ “Wrecking Ball,” Anaconda LaSabrosa performed a climactic number as she destroyed the walls Uma Gahd and Dot Dot Dot were putting up⎯an attempt to reinstate the order of the world they once knew. She advocated for the creation of a better society and was wary of the reiteration of old societal mistakes. The idea for Apocalipsync came about a year ago, when Uma Gahd and her husband Noah Gahd went on a camping trip. No one was around, and the setting felt apocalyptic, like they were the only ones left. While the Gahds’ camping trip inspired the concept, the script was written collaboratively between performers Dot Dot Dot, Anaconda LaSabrosa, Uma Gahd, and manager and director Noah Gahd. Uma Gahd noted that while they write together because they enjoy it, four people collaborating on the script made the job harder. While some of the House of Laureen’s content is explicitly political, such as Apocalipsync and Laureen: Queen of the Tundra, they share and embody values that are close to them. The House strives to be anti-oppressive, and to lead by example. “There’s often a lot of racist jokes that happen, a lot of transphobic jokes that happen, in the rest of the community,” said Noah Gahd. “That’s somewhere we step in and we’re like, no, stop doing that. That’s not funny.” He added that it is important to them to open up a dialogue in the community. Apocalipsync explored drag in the context of a narrative; it was powerful, entertaining, and necessary. Visit https://www.houseoflaureen.com/ for information about their upcoming shows.